Possessing a one-piece skull of deep flaring form with a broad, gently rounded crown, a long medially-ridged tail and a shallow trapezoidal face-opening covered by a pivoted visor of flat medially-ridged form, pierced at each side with a flanged vision-slit and secured to the, skull at the right side by a spring-catch with push-button release, the skull fitted at the base of its crown with a series of twelve flush lining-rivets with octagonal internal washers, the edges of the skull and, visor pierced with pairs of small stitch-holes, and the surface painted overall with an heraldic design, of white fleur-de-lis on a red ground. It would be hard to overstate the rarity and importance of this strikingly colorful sallet. 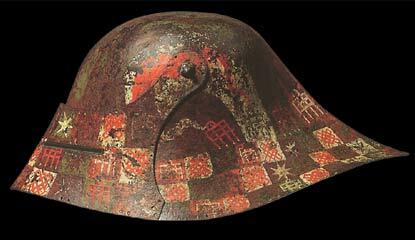 With its bold overall heraldic design, it can be counted as one of, perhaps, no more than half a dozen surviving helmets of the late 15th century to retain its original painted decoration. 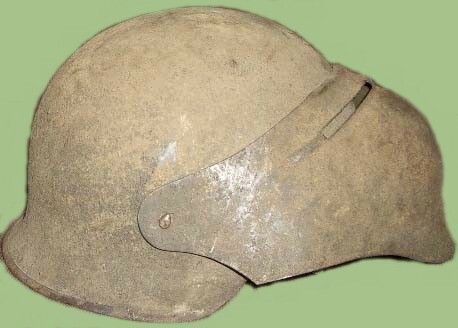 Helmets of this kind, intended chiefly for wear by the man-at-arms, have come to be called 'black' sallets from the fact that they were commonly supplied by the armourer with a 'black from the hammer' finish. In many instances, however, the black finish was subsequently concealed by the purchaser beneath either a painted design of the kind seen on the present well-preserved example, or a fabric covering, although evidence for such embellishment is now extremely rare. 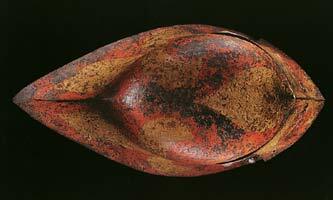 Only two painted sallets of the type under discussion have hitherto been recorded. The first, formerly in the collections of Professor Bahr of Dresden and Baron Peuker of Berlin, came originally from the Castle of Ort in Bavaria and is now in the Royal Armouries Museum, Leeds (Inv. No. FV.12), while the second, long preserved in the collections of Schloss Ambras, near Innsbruck, in association with the Milanese armour of Roberto da Sanseverino (d. 1487), but inscribed within its lining with the name of the Bavarian city of Ulm, is now in the Hofjagd- und Rüstkammer, Vienna (Inv. No. A3). The former is painted in red and white with a pattern of radiating flames at the crown, and a pattern of squares charged with stars, portcullises and diagonal trellises elsewhere, while the latter is painted in the same colors with an overall pattern of lozenges charged with stars. The alternative method of decorating sallets of this kind, namely with a fabric covering, is well shown in Albrecht Dürer's celebrated water-color drawing of a man-at-arms in the Albertina, Vienna, inscribed by the artist with the date 1498 and the legend 'This was the manner of arming in former days'. The same sallet is shown by Dürer in his later engraving of 'The Knight, Death and the Devil', dated 1513. Although no sallets of the type under discussion now retain fabric coverings, it is likely that three in the armory of the Trapp family at Schloss Churburg, South Tyrol, which are pierced overall, except at the top of the crown, with pairs of stitch-holes, would have originally possessed them. The same is true of a sallet in the Museo Correr, Venice, which shows similar pairs of holes around the lower half of its skull. 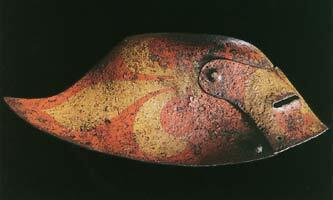 The pairs of small holes pierced around the edges of several other sallets of this kind, including those bearing painted decoration, may also have been provided for the attachment of a covering. Although it has been suggested that the purpose of these holes was to attach a lining, two arguments can be offered against this view. In the first place, the original quilted linings preserved in the three Churburg sallets, the Vienna sallet and a further sallet from Munich, formerly in the collection of the Baron de Cosson and now in the Royal Armouries Museum, Leeds (Inv. No. IV. 13), are in every case secured within their respective skulls by lines of rivets running around the bases of their crowns, rather than by the pairs of stitch-holes running around their edges. In the second place, the stitch-holes in question run not only around the edges of the skulls, but also around the edges of the visors. Since Dürer's illustrations show this kind of sallet being worn without a bevor, it has been suggested that the provision of a lining within its visor would have been desirable to reduce the effects of a blow to the face. However, such a lining would also have affected the proper seating of the visor, especially as the holes which supposedly served to attach it extend not merely over the face, but around the pivots and spring-catch of the latter. It seems most reasonable to assume that the paired stitch-holes pierced around the edges of so many 'black' sallets were provided for the attachment of a fabric covering, even if, as in the case of Leeds, Vienna and the present example, their purchasers ultimately elected to embellish them with painted decoration. Aside from the examples discussed above, 'black' sallets can be recorded in the Musee de l'Armee, Paris, the Museum fur Deutsche Geschichte, Berlin, the Collezione Odescalchi, Rome (Inv. No. 762), the Royal Museum of Scotland, Edinburgh (Ace. No. 1905.463.468), and the Von Kienbusch Collection, Philadelphia Museum of Art (Cat. No. 51). Sadly, the majority of surviving sallets of this type have been subjected to heavy over cleaning in a misguided attempt to remove their original 'black from the hammer' finish. The sallet shown here offers a rare opportunity to appreciate how such a helmet would have appeared when it was first made and decorated. That is a really menacing helmet. I find all of the sallet styles with bevoirs to be that way. Reminds me of the Disney movie The Hunchback of Notre Dame - all the evil soldiers have helmets like that. It is also interesting that they did all the same things with helmets that we do - paint them, polish them, cover them with cloth, etc. I guess it shows how painful reinvention is considering this came about for modern man in World War I.
Alina - aye, this is definately a "big bad guy" helm... I know I'd be scared! 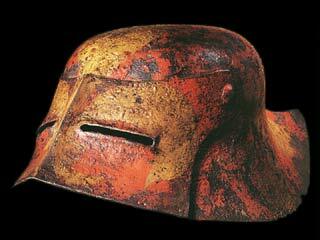 I admit I like the lines of the other (faily well-known) black sallet better, but that is a great piece of history. It would be interesting to see a repro with the original paint scheme, just to see it as it was when it was new. Imagine what an entire suit would look like if decorated in a similar manner. It's very impressive to see the three-dimensional shape of the helmet. From the side view one would think it was a very shallow, sloping design. The overhead view, by contrast, shows that the crown is quite distinct from the lower "skirt" if you could call it that. It was quite customary at this period to buy the sallet and then have it embellished to your own tastes afterwards,much of the adornment found on sallets of this period were done by workshops other than those of the armourer,those of the goldsmiths etc.Regarding the provision of holes for the possible fitting of a fabric covering,in England there had been a law since 1322 that forbade the selling of any helmet that was already covered with fabric.If memory serves me correctly, this law was passed because of some unscrupulous Italian agents and dealers selling inferior or damaged helmets etc.as first rate after they had been covered with material.Possibly similar laws existed elsewhere too? It is indeed difficult to see any other possible explanation for the holes around the visor pivot other than for the attachment of a fabric covering. WOW , i have alway's liked the look of a sallet these are simply incredible i think when i buy one i will do a little paint job of my own that is such a cool helm. In WWI, when the Brits, french, and Germans were looking for ways to reduce casualties (mainly from artillery bursts) they combed their respective museums for practical helmet designs to issue their troops. The Brits settled on a design similar to the chapel-de-fer, and the Germans produced several protoypes of essentially a black sallet (visor and all) before settling on a more modern design. The story is a lot more involved but is very interesting to any who care to do a little on-line research. Can you imagine if they'd kept the black sallet? We might have had nazis in black sallets for WWII. That would have been frightening. Thanks for this great article and picts! You had mentioned that the Durer paintings showed no bevor, but are we certain that there was no bevor? I was just curious because I think it would work well with one. Thanks again! I have one from the Kienbusch collection as well(or was it the Met? ), but haven't loaded the website for that museum's pics yet. Must admit this doesn't fall with in my time period of interest/study,but, these are some awesome looking armour / works of art and the info. is very interesting, to say the least. /guess it's always good to broaden one's knowledge. origin since it's sleek, and thats where Porsches come from. Sorry to resurrect this thread, but this helmet-type is one of my absolute favourites and I just found another example. Apart from the black sallet depicted in the Osprey book about the Swiss I haven't found any other examples. Are these really the sole survivors? No need to apologize, that piece is mind boggling! I'm picturing a whole flaming suit of armour. History truly is more fantastic than fantasy.